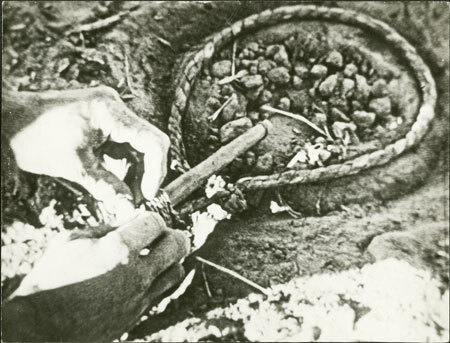 A close up of a Dinka man setting an animal trap (dang) on a game path, lashing two parts together near the loop. The Powell-Cotton's collected this trap, perhaps from the individual in this image, on the 3rd May 1933, and donated it to the Pitt Rivers Museum in 1934. It is likely that this print is a still taken from the cine-film made by Powell-Cotton during this expedition. Notes on print reverse Ms pencil - "No 7. Dinka Animal Trap. Lashing C and J together with the piece of string attached to J. Fanamweir, Sudan 1933"
Morton, Chris. "Dinka animal trap" Southern Sudan Project (in development). 03 Jan. 2006. Pitt Rivers Museum. <http://southernsudan.prm.ox.ac.uk/details/1998.207.3.7/>.